Image © DC Comics. 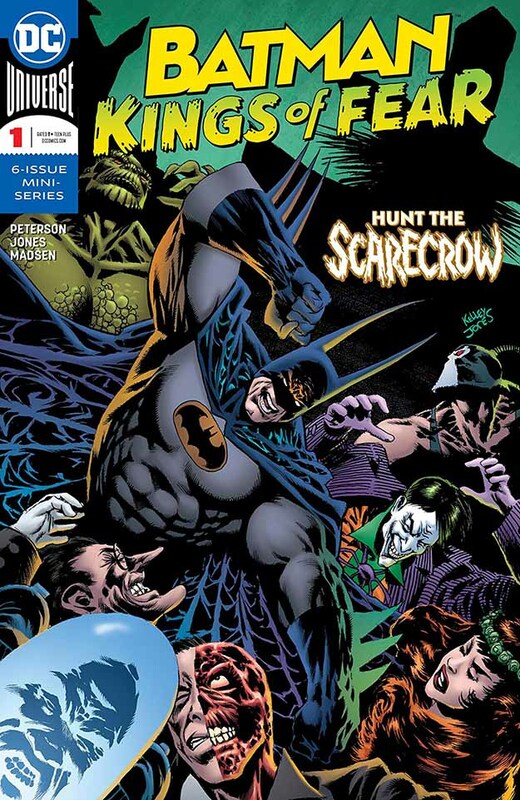 Written by Scott Peterson, art by Kelley Jones. I decided to give this a try. The entire miniseries is already out, but I hadn’t looked at it yet. I love Kelley Jones’ art, but I have to say it works best for me on characters that are already exaggerated caricatures of humanity. The villains, for instance. On Batman himself, Kelley’s distorted anatomy is sometimes distracting, but his art is full of love for the characters and the medium, and surely that’s a good thing. And how can you not love all the insane details? Batman begins by taking down The Joker, whose dialogue by Scott Peterson is amusing and insightful. When Batman returns Joker to Arkham Asylum, he’s berated by a doctor there despite the fact that he’s helping. Suddenly the entire Batman roster of crazed villains are out of their cells, and Batman must take them on single-handed. I suspect Kelley Jones asked for that! All this seems to be a prelude to the real threat, The Scarecrow, who has also escaped Arkham and whose fear toxins take Batman by surprise. The plot thickens. This entry was posted in Comics, Reviews on February 8, 2019 by Todd.